As a training manager, you are ready and excited to introduce e-learning in your organization. . But are you ready to present a favorable case to convince your top management? Do you think they will agree? What about employees? Remember, an organization getting into e-learning for the first time will need to take measured steps to ensure the initiative is successful. In view of this, the e-learning implementation strategy assumes importance. The implementation strategy starts with getting management buy-in, considering the costs and resources involved. The next crucial step is to make employees accept this form of training. It means a shift in learning methods, so their acceptance is crucial. So a clear strategy must be in place. This blog highlights the key points of a successful implementation strategy. To get the support of top management, align the objectives of the training (by e-learning) to the business goals. Compare the existing training practices and e-learning in terms of cost, effectiveness, and ROI. Quantify this in terms of numbers and also highlight the less tangible and long-term benefits e-learning will bring to the business. Once you get the management buy-in, the next step is to convince employees about the initiative. Tell them how they will benefit from e-learning. Before you introduce them to e-learning, find out what people want to learn in their jobs and how, where and when they want to learn. You can then tell them how e-learning will meet their needs. Tell them of the advantages e-learning offers in terms of the flexibility to learn anytime and anywhere and access training when they need it, even beyond work hours. If the stakeholders are open to change, you can leverage this aspect to get employees’ buy-in. Experts recommend using various communication methods to communicate the compelling reasons to adapt e-learning. This has to be delivered to line managers, instructors, employees, and other stakeholders before and during the implementation. Once you have the buy-in of the top management and employees, it is advisable to start your e-learning implementation initiative with small steps. Do not invest in hiring a team for e-learning development or authoring tools. Instead, you can outsource your e-learning development to a vendor. Even if you are outsourcing, do not start with a big course. Take baby steps with small courses. For instance, you can begin with a course on compliance training as this training is mandatory for all employees. But remember the topic should be suitable for an e-learning approach. Invest in an open source LMS such as Moodle or use the internal servers in your Intranet to host the courses. Invest in off-the-shelf courses instead of customized courses. These can be hosted on the vendor’s LMS and once your learners get used to e-learning, you can invest in an LMS and customized courses to meet your training needs. Getting your feet wet this way will make it easier for employees to adapt to this training mode. Starting small will help you gain acceptance from the management and employees. Launch the initiative with a message from the CEO that underlines the importance of the initiative. Department heads must be made to understand the e-learning plans for their group and more importantly, their role in implementing them successfully. 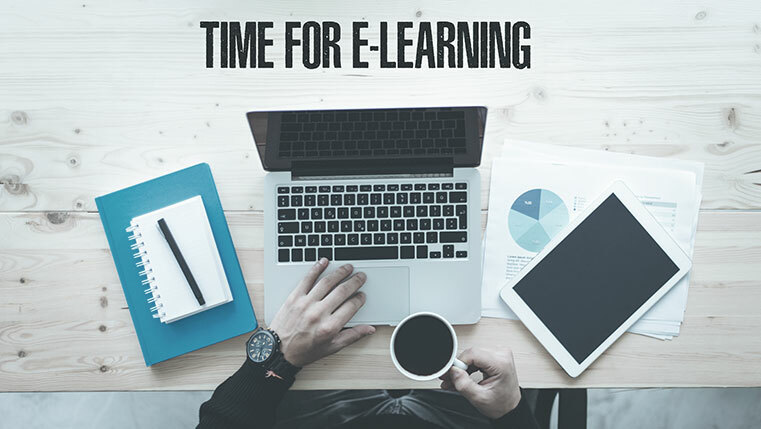 Employees must understand the objectives of their own personal e-learning development programs and their role in achieving these objectives within specified timeframes. Communication between the management and employees must be ongoing and feedback mechanisms must be efficient. Careful planning and execution of the change management strategy will ensure the initiative is successful. Once everyone is on the same page regarding the e-learning implementation and the initial steps are met with success, you can expand your training with more courses. You can choose to build your own courses or outsource to a vendor who provides customized e-learning solutions. You can combine both the options by building some courses in-house and outsourcing some. You can even develop a part of the course internally and outsource the other parts. The choices are endless, read our blog to get a better insight. Good luck with your e-learning initiative!